There’s something to be said for the quality of the wineries and the restaurants of the Western Cape, but families often find that it is restless to spend days either tasting wine or appreciating long family conversations over lunches that last way past when dinner should start. One of the activities that keep active families busy is hiking. There are great possibilities for day hikes for families of different ages and experience. 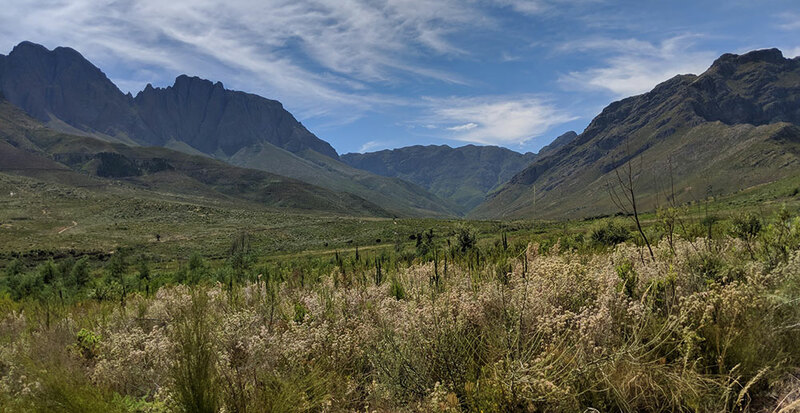 Just outside the town of Stellenbosch is a beautiful valley called Jonkershoek. Different times of the year will give different experiences as the waterfalls and rivers fill up, and the landscape becomes greener in winter. To get there, you will first need to drive to the main gate at the end of Jonkershoek Road. At the main gate, you will need to pay your entry fee and continue driving about another 15 minutes up the Jonkershoek 10km loop to designated parking areas. It is advised, but not required, to take a vehicle that has higher clearance as the track is dirt from the gate onwards. If in doubt, check with the gate staff, as after periods of rain when the ground can become soft, and a 4×4 could be required. This hike is good for children of all ages, and the paths are mainly flat and uncomplicated. 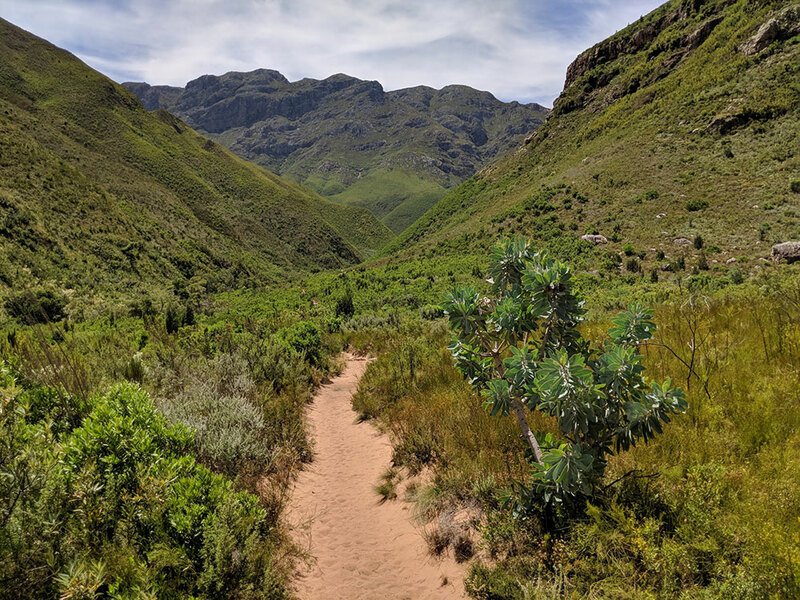 Hikes in Jonkershoek can vary in length based on the experience of your group, but a short 45-minute slow walk should get you to the first of the waterfalls. There are no restaurant or similar facilities in the park, so be sure to carry enough water for your group. It is not advised to drink water from the rivers of the waterfalls, so count on taking as much water as you can with you – especially on a hot day. Table Mountain is arguably Cape Town’s number one tourist attraction, but many more visitors decide to ride the cable car to the top of the mountain, than hike it. Remember that it is also possible to hike up the mountain and then take the cable car down. Depending on the time of year, and from where you decide to climb the mountain, the weather and the heat of the sun can play a significant role in the overall mood of the group. There are parts of the mountain that are relatively shaded in the morning hours, so this can significantly reduce the rush in the morning and allow families to get everything packed that they are going to need for this adventure. There’s no getting away from the fact that climbing Table Mountain is a steep climb to the plateau, where it then levels off. 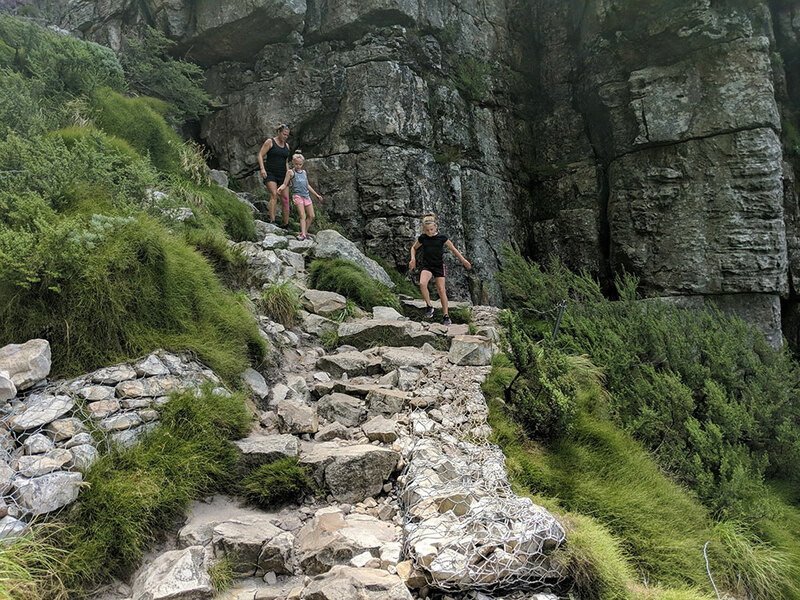 I would not try climbing Table Mountain with anyone younger than 7-years-old. I would go as far to say that 7-year-olds who do not have physical fitness should avoid this hike. At times, the hike will be a continuous upward slope and scrambling over boulders will be needed. 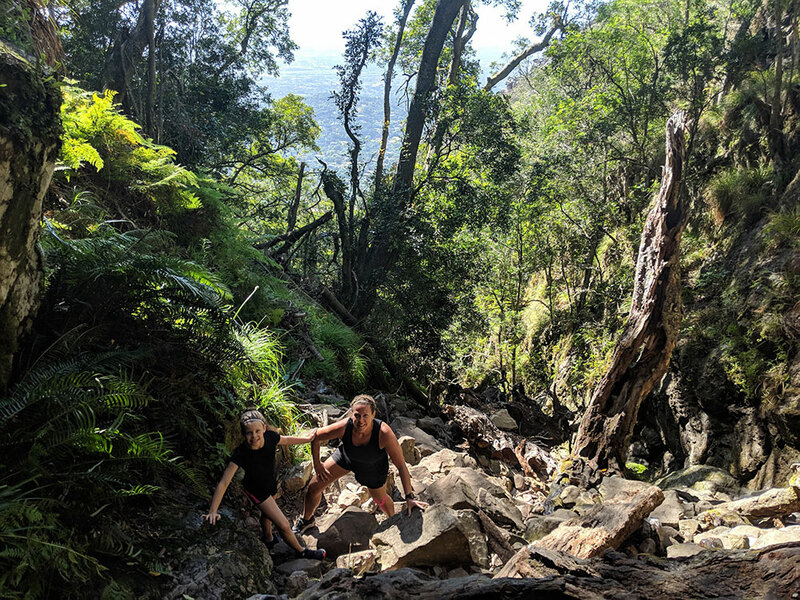 The recommended route for a morning climb would be to start at Kirstenbosch Botanical Gardens And climb up the mountain through Skeleton Gorge. At the top of the gorge, there is a reservoir which makes a perfect stop for a snack and a breather, before continuing to the highest point of the mountain and eventually to the upper cable car station. The hike from the botanical gardens to the upper cable car station will take approximately 4 hours including breaks, and a start before 8 am is recommended in the summer months. 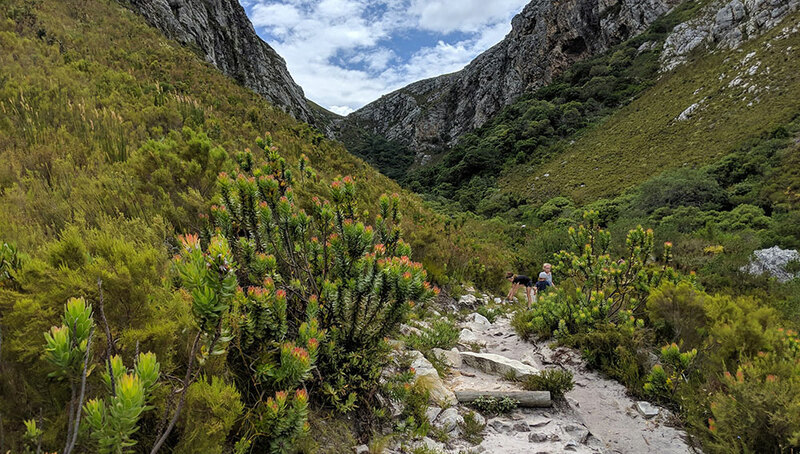 Should you still have more energy and want to continue the hike, there is always the possibility of walking down Platteklip Gorge on the Cape Town city center side of the mountain, which will add two hours to your trip. Patteklip Gorge is a near continuous staircase, and potentially more difficult for children with short legs. Also located in central Cape Town is Lions Head. It is the higher of the two peaks on Signal Hill. 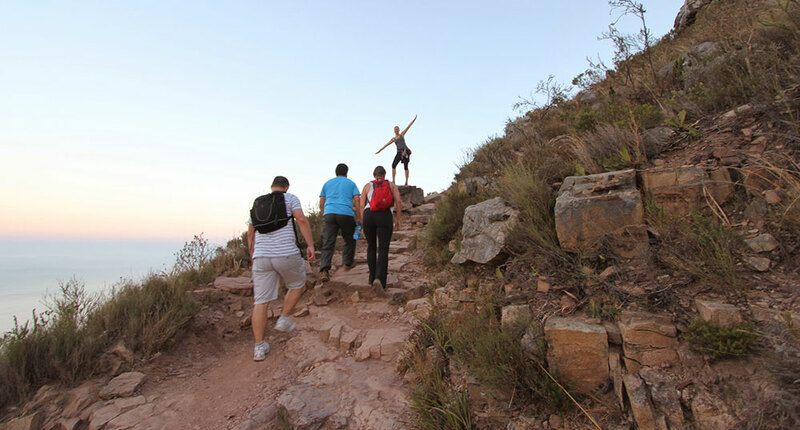 Lions Head is a much steeper, yet shorter, climb than Table Mountain and sometimes the drop-offs are significant. This hike is a great option for early risers who want to be back at the hotel by breakfast. The climb is approximately 45 minutes up from the parking area at the trailhead on Signal Hill road and about 30 minutes down depending upon the amount of foot traffic coming from the other direction. For those who want a little more adventure, there are cryptic directions to a cave on the side of the mountain that looks out over Camps Bay and the Twelve Apostles. To climb Lions Head, the group should be physically fit, have hiking experience, and not have significant issues with a fear of heights. A 6 am start is recommended. The views at the top are well worth the climb, with 360-degree views of Cape Town, Table Mountain, the Cape Winelands, and Robben Island. Leopards Kloof hike is a little of the regular tourist track. It is in an area of the Western Cape called the Overberg and just east of a small coastal town called Betty’s Bay. The entrance to the Leopards Kloof is located inside the Harold Porter National Botanical Garden and follows a valley out the back of the property. The trail ends at the Leopards Kloof waterfall and pool surrounded by high cliffs. Halfway along the trail to the falls, there is a gate that will require a key to open the padlock. Obtain the key from the front gate in exchange for a small cash deposit. It is also advised to purchase the map as it will give you an idea of the other walks possible while you were visiting the gardens. 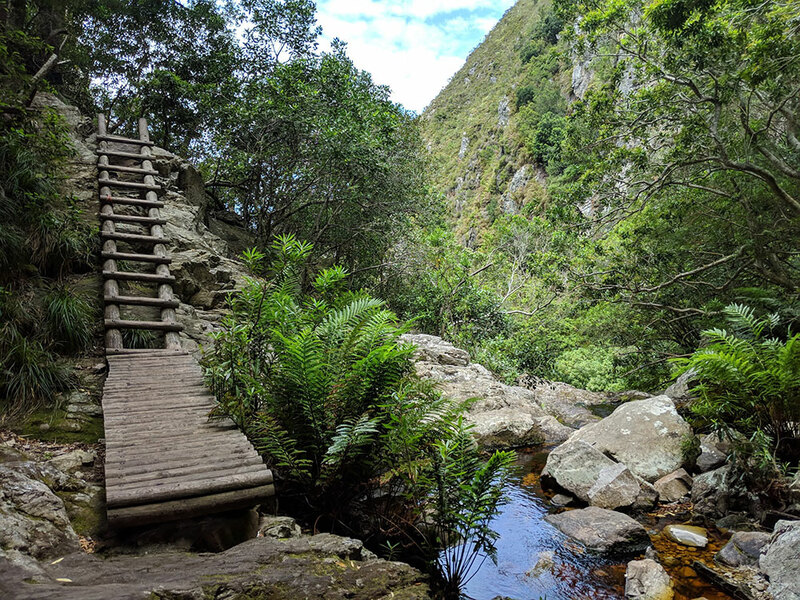 Leopards Kloof is a great hike for smaller kids, as much of the path can be walked, and the occasional ladder will give them a sense of adventure which will undoubtedly be the highlight of the day. The hike will take anywhere between two to three hours, and as long as you start the hike before lunch, there should be no issue with completing it before you need to return the key. The drive from the Harold Porter National Botanical Garden to Stellenbosch or Hermanus is about 1 hour, and the drive to Cape Town will be about 1.5 hours. The added advantage to making this trip is the views from the coastal road as it winds through the small towns of the Western Cape.